The connection between the pioneers, railways and elevators goes back to the late 1800’s and early 1900’s. The Canadian railways advertised in the United Kingdom, Europe and elsewhere to attract settlers to western Canada with the lure of free land (or nearly free) $10 per quarter section (160 acres) or 6.25 cents per acre. Today this land is valued at around $2000. per acre. In the advertising to attract people to settle the west there was an avoidance of mentioning the prairie winters. The winter turned out to be much more severe than some settlers had expected. The settlers came in large numbers mainly from Europe, United Kingdom and the United States to settle the west. Towns sprang up almost overnight around railroad stations. 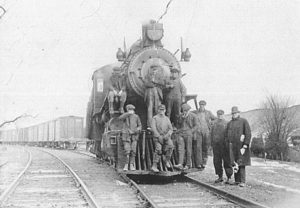 The railroad brought in both the new settlers along with supplies and mail. They also provided a vital communications link to the rest of the world through the railroads telegraph system. 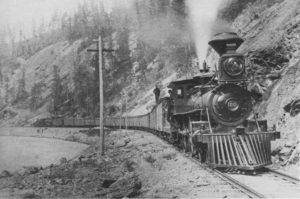 The first railroad station agent in Nanton was a gentleman by the name of William Allen. His grandson, Jim Coutts, is currently an honorary member of the Discovery Centre’s Board of Directors. As the towns grew, so did the various businesses. They included the post office, real estate offices, general stores, blacksmiths, hotels and boarding houses, restaurants (often Chinese), lumber yards, machinery dealers, bakeries, pool halls, livery barns, feed stores, doctors, dentists, pharmacy and of course the grain elevators. Grain elevators were spaced about 5 – 8 miles (8-13 km) apart. As all the grain came to the elevators by horses, mules or oxen, this was considered a good day’s haul with wagons or sleighs depending on the weather. 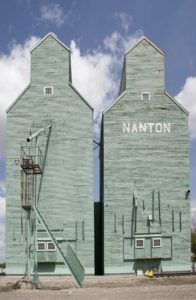 Many towns such as Nanton, Parkland and Cayley had 5-6 elevators owned by different companies. Smaller towns may have had only one or two elevators. Wagons and sleighs have been replaced today by trucks of all sizes from the small ½ ton all the way up to the “Super B” double trailers seen hauling on the highways today. Pioneer Grain’s first elevator was built in 1929 Initially the elevator’s capacity was 56,000 bushels, but this was increased ten years after the elevator was constructed in 1939, two annexes were added with capacities of 17,000 and 11,000 bushels for a total of 84,000 bushels. 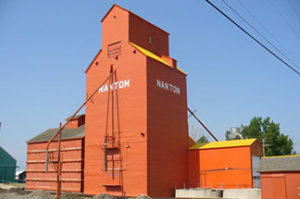 The Elevator in Nanton was not built by the Pioneer Grain Company Limited, but by the Independent Grain Company Limited. Pioneer acquired the elevator from the Independent Grain Company Limited in 1954, when it acquired the entire 22 elevator line of the Independent Grain Company. Pioneer expanded the elevator in Nanton shortly after its acquisition. In 1956, a more substantial annex with a capacity of 34,000 bushels was constructed for the elevator and the smaller annexes were demolished. This provided Pioneer a total capacity of 90,000 bushels. In 1982, Pioneer Grain completed an extensive upgrade on the Nanton elevator. Two steel bins were added to the facility, which brought the capacity of the elevator to over 100,000 bushels. The installation of a 60 tonne, 70-foot scale made the facility capable of handling larger farm and commercial trucks. Coal sales to local citizens, farmers and businesses. The coal came by train and was hand loaded onto customer’s vehicles and each load was weighed. Fertilizer and crop protection products were received, stored and distributed to farmers when required. Elevator Staff was available to perform moisture tests during harvest for farmers’ grains to ensure safe storage without spillage. Some elevator managers sold hail insurance. Elevators were also social centers where everything from politics, grain prices and sports were discussed….some over a card game. Elevator staffs were usually very trusted community members who volunteered and participated widely in prairie communities. The elevator was shut down in March 2001 and the steel bins were sold in 2004 to Bear Trap Feeders, to enable us to have money to start the restoration. Josh Green and Willard Kjinserdahl of Nanton district were the first farmers to deliver grain to the newly upgraded elevator. While under Pioneer management the elevator at Nanton was run by several long-serving elevator managers. D.C. Thompson was the Elevator Manager from 1954 to 1963. Charles P. Rogers became Elevator Manager in 1964 and served at Nanton until 1990. T.L. Hopkins managed the elevator until 1992, when he was succeeded by G.G. Lindsay. D. Declereq became the Elevator Manager in 1998. At the beginning of 2000, he was succeeded by A. Erker, who would manage the elevator until its closing on March 20, 2001.